We are the leading manufacturer and supplier of Aluminum & Iron Truss to our valuable clients. we used the best material alloy 6082T6. this grade is the best for aluminium truss. we can use truss in so many events like marriage, corporate events, booth truss. truss make the events attractive. 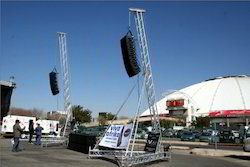 Our organization has successfully expanded its business in market owing to the offered elevated quality array of Line Array Truss. Our offered truss is highly demanded in the market for its compact design, corrosion-resistance and durability. This truss is manufactured with the help of fine grade raw-material and progressive technology in adherence to set industry norms. Moreover, truss offered by us can also be availed in various sizes and shapes as per different requirements of our precious clients. Looking for Truss System ?